When considering the perfect patio for the garden, many people think about the materials they want to use, however there are considerations you need to make before this, including the location itself. 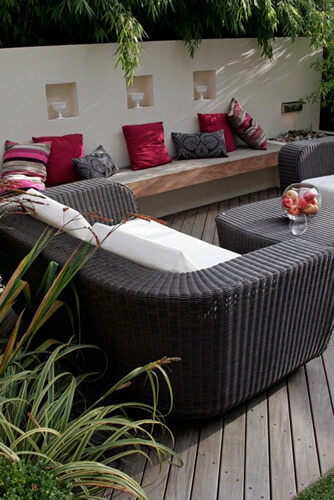 Where a patio sits in your garden plays a bit part in how often it is used and how well it serves its intended purpose. For example, if you are using your patio for dining, then it makes sense to have it close to the house – so you don’t have to walk across the entire garden from the kitchen with your food. You may think that having it tucked away from the house would be a nice feature, but realistically consider how often it would actually be used if you were to do so. You also need to consider the climate of your proposed patio area. Even the smallest gardens can have different climates and the area closest to your house could either be a heat trap or subject to unpleasant wind. Either way, this is likely to affect your overall use of the patio, so should be considered before you even start planning. Another factor to consider is the view. The perfect patio will have a nice view of your garden, or perhaps even of your house. You want privacy within your patio, so you need to ensure you aren’t going to be overlooked. This often is the case, however, if it deems too much of a problem you could erect fencing or trellis to give slightly more privacy. A final consideration is the wildlife around your perfect patio spot. Consider the proximity of large trees, which may affect your patio with root damage or even during stormy weather. You should also consider accessibility to required functions. For example, it is likely you will want electricity for lighting on your patio. If your patio is near to your house, then this shouldn’t be too much of a problem but if it is in a more remote area, then you will need to consider accessibility. Your next consideration should be the design of the patio itself. The design of your patio should take into account the style of the house itself. If you have an old country style home then you may consider ‘decking’ whereas a modern house may prefer the ‘paving’ style. There are lots of considerations to be made when designing, constructing and enjoying your patio. If you’d like to discuss this or any other aspect of garden design then please contact us via email or our social media channels.